← ‘The Fabulous Moolah’ Carries a Wicked Dropkick, Doesn’t It? One is a genius, the other’s insane. Such go the lyrics of the 1990s animated series Pinky and the Brain, about two cage-sharing laboratory mice. Today’s funny-named couple are not mice indeed, but they could be deemed Plinky and the Brawn. Yep, that there is Plinky–the one in the skirt–and you know who the Brawn is. And I don’t mean LeBron. Actually, the Brawn was a Texan named Adolph (before Adolf oozed of evil connotations) Toepperwein (before Tupperware oozed of delightful connotations), a rifle-doting trick shooter who toured the vaudeville circuit at the turn of the century (not this one; the one before). On a visit to a Winchester Repeating Arms Company, he met an employee named Elizabeth Servaty. He said, “Hey, nineteen” (her age at the time) and fell immediately in love with her. In 1903, Ad took her to be his wife, despite the fact that she was a Connecticut native, and put a ring on it. Fortunately, his ancient 34-year-old fingers were yet nimble enough to teach her how to fire a gun for the first time in her young life. With a .22, she shot at tin cans, and after several tries, she nailed it. 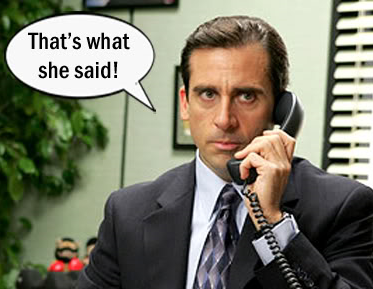 But that’s not what she said. At least, that’s what http://www.petticoatsandpistols.com says. And they should know; they have this cool pic of her shooting one-inch chalk pieces from between Ad’s fingers. Never again did a soul call her Elizabeth. Thereafter, she became Plinky. And nobody messed with her because she had a Winchester and she knew how to use it. And a pistol. And a shotgun. 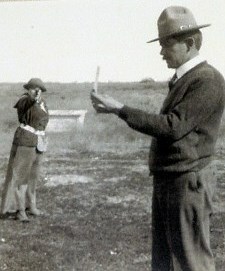 In fact, she became the first dame to break 100 straight targets at trapshooting. But she also shot marbles, apples, oranges, and eggs. And two-timing adulterous philanderers, should it come to that. 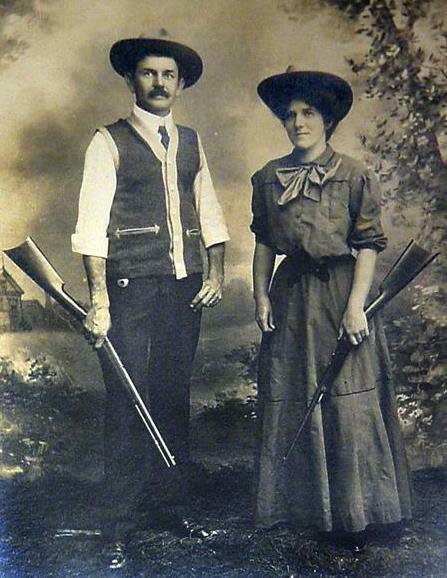 Ad and Plinky spent the next 40 years touring as a husband and wife trick-shooting team before the country was divided over gun control. To entertain the audience, they shot while standing on their heads, and then while lying on their backs. She once scored 497 out of a possible 500 with a .38 Colt at 25 yards, closely approximating military timed fire. Even Annie Oakley gave her big ups, telling Plinky she was “the greatest shot I’ve ever seen.” And if that’s not props, I don’t know what is. 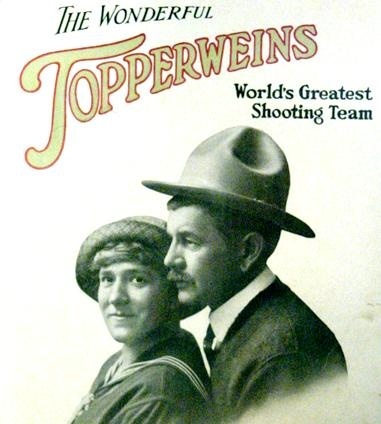 This entry was posted in funny names in sports and tagged 1900s, Toepperwein, Trick Shooting, Winchester. Bookmark the permalink. Bravo, Kerb! You know it’s real love when you trust each other enough to shoot chalk from each others’ hands at 20 feet. When they had guests over for trick shooting cups and plates did they call them Toepperweire parties? Annie’s got a gun, Plinky had every gun. But did Plinky live long enough to burp Tupperware? (head exploding) She lived till 1945, I know that. Perhaps she never knew the pleasure? Again with the narrow waist. I agree with wdydfae. It must be love if you trust her with a Colt. But what if she sneezes? Well I guess he would change his name to Stumpy. this is one of the best-matched couples i’ve ever seen, with the perfect vocation. i would not even think of messing with plinky. I think Plinky was way too an informal of a nickname for this shooter, Kerbey. Madame? Queen? WhatCanIGetYouDear? Great find. Adolph married up, for sure, and speaking of names, he did not have to become known for having his meat tenderizered, either, such a good shot was she and so loyal was he. Loyalty will keep you bullet-free. But just think–she came up w/ that term, and now they have plinking targets and it’s a legit word. Why, even wikipedia uses it! I totally remember these two from our vaudeville days, kerbey! Also, this might be the finest piece of writing this side of William Faulkner. “Actually, the Brawn was a native Texan named Adolph (before Adolf oozed of evil connotations) Toepperwein (before Tupperware oozed of delightful connotations)” Splendid stuff! Also, I’m gonna start referring to women as “hey nineteen”! Even if they’re not 19, I think they’d be flattered, and it seems to have been a very successful line! Haha, I read Naked Lunch back in high school, so I know what a Steely Dan is 🙂 I’m just bummed I missed the Hey Nineteen reference…. My Steely Dan knowledge is sadly limited to “Do It Again”, but that will change soon. Most importantly… you had a 19 year old bartender? How did that happen?!? Is that even legal? Aha, you DID know! It’s very hard to keep up w/ all of the old people music; there are droves of it. Here’s the 411 (nobody says that anymore, do they? ): In California, you have to be 21 to bartend. In Texas, you have to be 18. Plinky Toepperwein is one of those names that launched this blog. Not specifically, because this is the first I’ve heard of her, but she’s why we’re here. It’s simply wonderful. And she seems like she was a heck of an interesting lady too. I suggest someone get the movie together right away. Plinky and Adolph’s Big Shot. I like it, I like it. Let’s work on a script and some casting. I read that Plinky always called him “Daddy” and he jokingly referred to her as “my current wife.” So we can use that. And we’ll need to include the fact that Ad was working at a pottery shop to help his widowed mom keep a roof over their heads when Buffalo Bill’s Wild West Show came through the Alamo City with Doc Carver, the marksman with the shoulder-length locks, who proved to be Ad’s inspiration. I’ll see if I can locate Johnny Depp to play Doc.